The Fall Retreat is a weekend of learning, bonding, playing, planning, and having fun. We travel an hour north to the Marin Headlands, where we get back to our roots with campfires, bug juice, and bunk-beds. It’s Hillel’s way of kicking off the year with a bang by introducing students to eachother and setting the scene for an incredible first year at Berkeley. For more information, visit the Freshmen Retreat page. 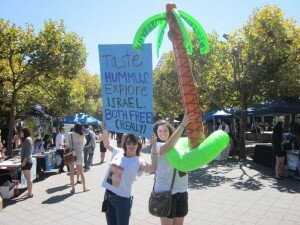 Birthright Israel is a FREE 10-day trip to Israel with Berkeley Hillel. We send 40 students from Cal every winter & summer break. This trip is truly a life-changing experience, and it doesn’t stop there. Our goal is to extend Birthright beyond just the 10 days you spend abroad, by continuing to cultivate the friendships we made on the trip once back on campus. For more info, email Molly Shapiro, Director of Engagement. In addition to our Birthright trips, there are many more ways to get to Israel, such as the Hartman Fellowship and Perspectives. Check out our Israel Study Abroad and our Israel Opportunities pages for more info or get in touch with our Israel Fellow for more information. The Marla Bennett z”l Fellowship is given to one Berkeley student each year to spend the summer learning at the Pardes Institute of Jewish Studies in Jerusalem. Fellows will advance their own Jewish learning and develop their relationship with Israel. More information about the Marla Bennet Fellowship here. In addition to the trips that Berkeley Hillel organizes, scholarships are available for students who want to participate in immersive experiences of their choosing. If you would like to apply for a Berkeley Hillel Scholarship for this kind of experience, please complete the SCHOLARSHIP APPLICATION at least one month before the registration deadline.